I’ve been deep into freelancing and consulting since the layoff in January. One of the benefits has been a drastic reduction in the amount of meetings I need to attend. And the meetings I do attend actually require my attention. The bad side of that equation has reduced my drawing and doodling opportunities. So it was a great surprise and relief when I received this drawing last week in the mail done by Kevin Duke from Oyster Bay, Long Island. His father, one of my best friends, sent it thinking it fit within the “mcglinch” genre. 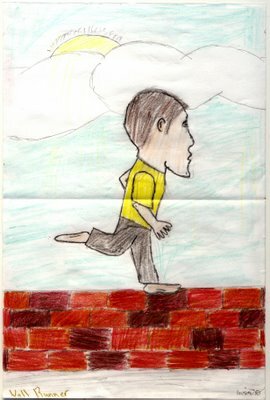 It seems to me that there’s few things more liberating for a kid than the opportunity to pop up onto a wall and run it. To challenge gravity, balance, and your parents’ nerves and to see the world from a different perspective — all in your bare feet — must turn an ordinary stroll into a real-life adventure. Thanks, Kevin, for letting me post this. Send more when you get a chance! This entry was posted in guest artist. Bookmark the permalink.